Wm. 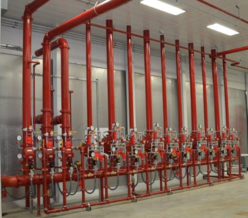 Crook Fire Protection has been designing, fabricating and installing fire suppression systems since 1963. Our primary area of work is the design, fabrication and installation of above and underground water based fire suppression systems, low and high water mist systems, deluge total flooding and diesel and electric fire pumps. We specialize in technical design-build projects but have the ability to fulfill any need a customer has. We are fully insured and have a single project bonding capability of up to $5,000,000. We are members of the National Fire Protection Association, the Society of Fire Protection Engineers and the Construction Association of Michigan. We are signatory to the National Fire Sprinkler Association, Sprinkler Fitters Local Union No. 704, Local Union No. 669 and National Maintenance Agreement Policy Committee (NMAPC). The safety of our and customers employees is first and foremost. We have a full time in house safety representative that oversees every project and thoroughly trains every employee. All of our employees are MUST trained and many have undergone OSHA 10 or 30 hour accreditation. All of our foremen have undergone Red Cross First Aid/CPR training and certification. We have zero tolerance drug free workplace with every employee undergoing mandatory drug testing. Our team of drafters use the latest computer aided design software. Our engineers use 3D modeling to integrate our suppression piping into any BIM process. We have FPE and NICET certified drafters on staff to oversee all of the design work that we do. These designs meet or exceed the latest NFPA, local, and customer’s design criteria/codes/standards. The staff of Wm. Crook Fire Protection is very unique from many companies due to the high level of experience and education. The engineering department has over 100 years of fire protection design experience between the six engineers. Wm. Crook Fire Protection’s engineers serve as project managers and have the authority to qualify as a commissioning engineer. This hands-on approach is part of the quality control of our installations. We have a 20,000 sq.ft. warehouse and fabrication facility that supplies custom piping systems to our customers as well and our own installation crews. Our fabrication shop has the capability to roll groove, cut groove, thread, weld and paint all of our fabricated components. We have a specified and qualified welding procedure in full compliance with NFPA 13 requirements. We have a large stock of materials necessary for emergency repairs and are centrally located in the Detroit Metro region for quick response to emergencies. We have a large team of highly trained sprinkler fitters to install both above and underground fire suppression systems. We have numerous union affiliations that ensure the necessary training as well as the ability to scale to any project size. We have a fleet of service trucks to be able to respond to an emergency repair quickly with minimal deliveries necessary. All of our foreman have a minimum of 10 years of experience in the installation of fire protection systems.